A typical diode and its schematic symbol. Diodes are solid-state devices, a little like transistors, but with only two leads. In transistor sets they are often employed to convert RF or IF to audio signals. 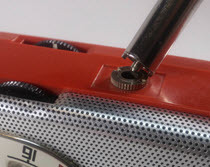 Their anodes and cathodes are marked, and this polarity must be observed when replacing them. 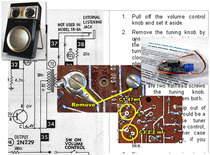 Like transistors, careless soldering can easily damage them. 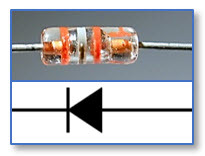 The illustration shows how a diode looks in person and on a schematic.